“Quarrying at Stonewall began ca. 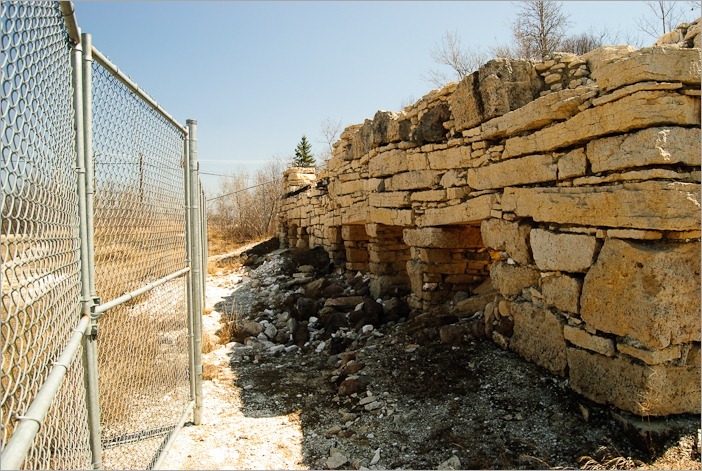 1880 as part of an emerging limestone industry in southern and central Manitoba. 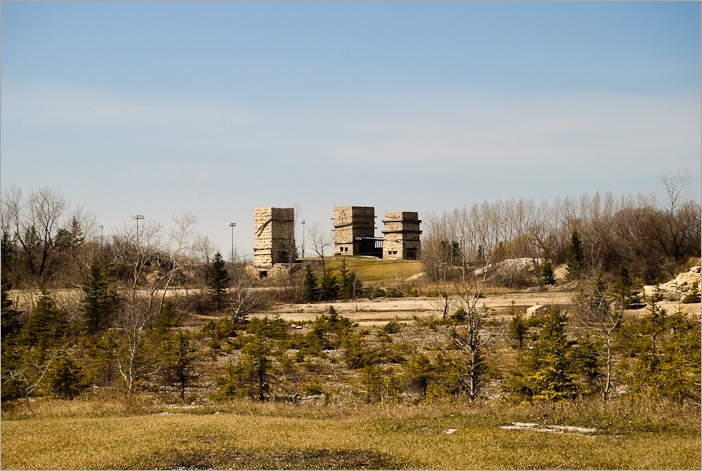 The Stonewall quarries were noted for their continuous production of various limestone-based construction materials. 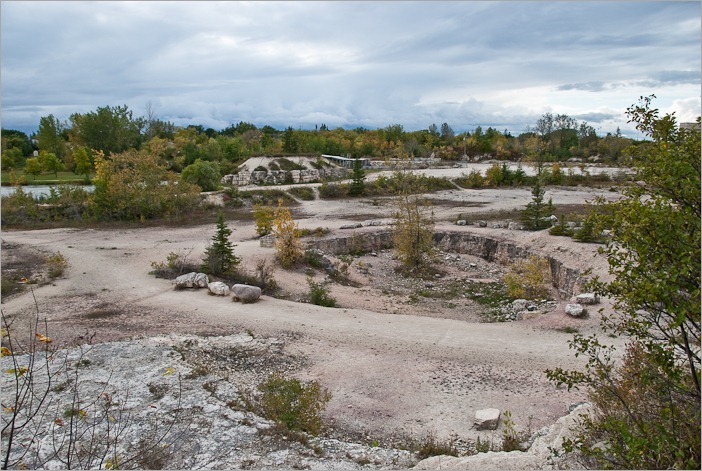 The quarries were long the economic mainstay of the town. This is the text on one of the commemorative plaques in the quarry of Stonewall. Now, what does this quarry look like? While I only have pictures from today, we may get an impression of the past. 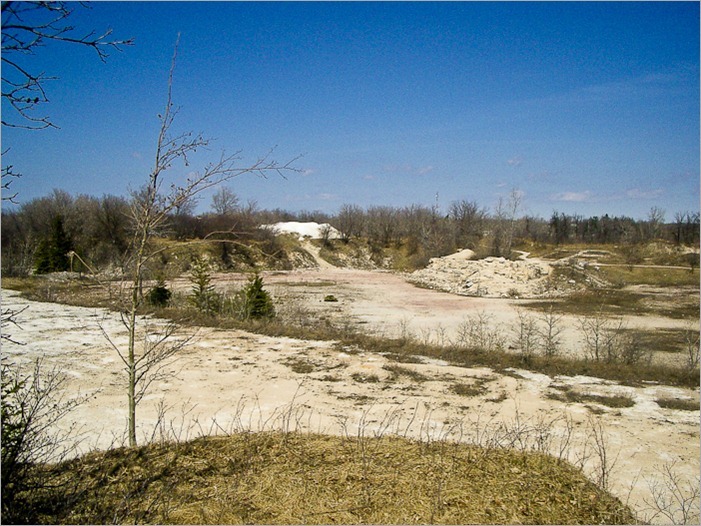 The quarry grounds are still there and have seen little change since the closure. The now barren ground of the quarry starts to get some growth, but nothing really wants to grow on these rocks. These were the places where the original limestone was taken. Right now, some places look like snake pits, but I didn’t spot any snakes. After the quarrying of stone came the more sophisticated quicklime. It had to be burned in ovens called kilns. 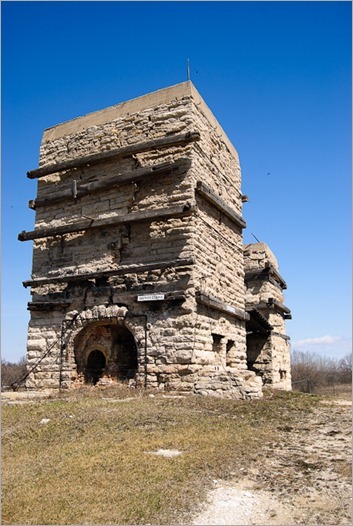 The original kilns did not yield much quicklime and the process was slow. This is what is left of the original kilns, in a corner of the premises, near the road. They are now in a bad state and totally closed for visiting, at least inside. Of course, after a number of years engineers found better ways to produce quicklime with better quality and more and more… Progress never stops. These forbidding looking towers heated up the limestone to turn it into quicklime. 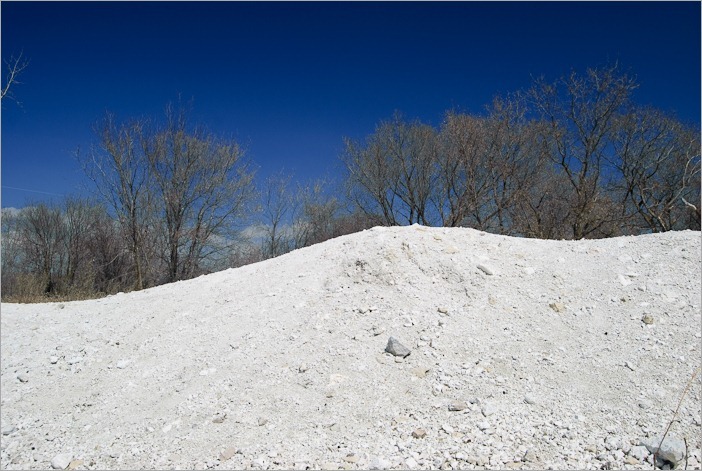 Quicklime is used in plaster and is very white. It also burns everything it encounters. It was often used as a decontaminant in hospitals and cemeteries. When it comes out of the kilns it will have to be “doused” in water to become stable and loose the danger of burns. Not all limestone and quicklime has been removed from the premises, the quicklime has been doused by years of rain and snow, no danger left. However the sight of the stuff is rather interesting, at least in summer. The white substance really gives the impression of snow. Leftover and unusable limestone heaps are still here. You can walk on them if you don’t mind white shoes, socks and trousers… Speaking of walking, you can go nearly everywhere on the terrain, except for the obviously dangerous places. Still looming over the landscape although restricted in access, these structures are now too dangerous. Today the quarry is a pleasant, quiet park with lots of green but still filled with the history of frantic economic activity. If you want to go there for pictures, the best time is in early spring, even if the green is not yet complete, at least you will have a good overview of everything. After that the trees will obscure most of the view. Only one last advice. If you go there, don’t take your Sunday clothes. 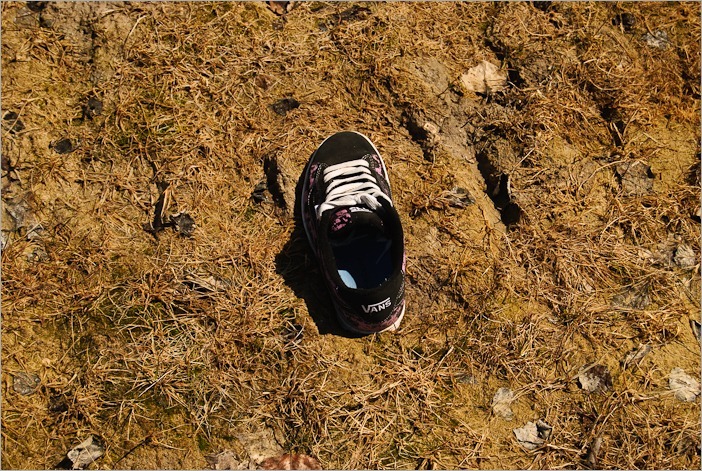 If the ground is still a bit wet, don’t take your good shoes, and if you do take shoes, make sure they stay on your feet. The mud and the limestone dust is quicker than you think with claiming what is yours. I wish you a very pleasant day in Stonewall, it really is worth your time.